Cree LED Lighting Solutions, Inc. (formerly LED Lighting Fixtures, Inc.) is located near the global technology center of Research Triangle Park, North Carolina. LLF was founded by Gerry Negley, Neal Hunter, Tony van de Ven and Thomas Coleman in September of 2005. These individuals came together to combine their lifetimes of experience in LED chip, component and system technologies and bring LEDs into the general illumination market. The founders built a team with strong backgrounds in R&D, manufacturing, marketing and finance. Through unmatched creative innovation and market experience, Cree LED Lighting delivers highly efficient, long-lasting lighting products. Our core LED technology provides solutions for residential, commercial, industrial and institutional applications. Cree lighting products deliver high efficacy, rich color rendering and a superior quality of light that is appropriate for any home or business environment. More importantly, our products help to solve two of today's major concerns: rising energy costs and the need for a "greener" environment. Cree, Inc., a market leader in LED lighting, announces a new lighting-class LED designed for high-output, small form-factor directional lighting applications. The XLamp MT-G LEDs are optimized for 35W-50W halogen MR16 retrofit bulbs and other accent, track, display and down lighting used in retail stores, residential settings, museums, art galleries, hospitality and landscapes and are the first commercial LEDs to deliver sufficient light output for these applications. The multi-die XLamp MT-G LED features Cree EasyWhite™ technology to deliver consistent color in a small, highly efficient package. This innovative LED is designed for the high-lumen, small-footprint requirements of 35 and 50 Watt halogen retrofit lamps. Cree engaged driver, thermal and optic providers to create an MR16 lamp reference design to further enable its LED customers to quickly address this market. The XLamp MT-G LED is the first in the industry binned and tested at 85 degrees C which can simplify luminaire design calculations and speed time-to-market. With a 9mm x 9mm footprint, the MT-G LED delivers up to 560 lumens at 1.1A at 85 C or up to 1525 lumens at 4A at 85 C in warm white (3000K). Cree, Inc., a market leader in LED lighting, announces commercial availability of the LBR-30™ LED lamp, aimed at replacing energy-wasting incandescent lamps commonly used in tracks, commercial and residential recessed downlights. Powered by Cree TrueWhite® Technology, the lamp delivers beautiful, warm-white light with unrivaled color accuracy and efficiency. "We were highly impressed with the installation of LBR-30 lamps in our Pittsburgh, Pa. LEED Gold designed location," said Andrew Dunmire, AIA, LEED AP, vice president of design and construction at Eat’n Park Restaurants, a restaurant chain with 75 locations throughout Pennsylvania, Eastern Ohio, and Northern West Virginia. "The lamps truly brought our space to life by highlighting the vibrant walls and furnishings, while the reduced energy use, compared to the incandescents, saves us every month on ongoing operating expenses – enabling us to achieve our sustainable design objectives." Thanks to its high color rendering index (CRI) of 94, the LBR-30 lamp is optimized for applications where high color accuracy is essential, including restaurants, retail stores, groceries and museums. 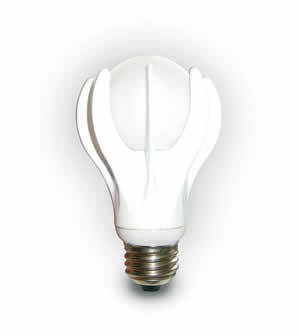 It delivers 600 lumens, equivalent to a 60 watt incandescent BR30, while using only 12 watts of input power. The lamp is designed to last 50,000 hours in open fixtures, which can provide merchants like Eat’n Park additional savings from reduced relamping and maintenance costs. "The LBR-30 lamp’s superior blend of incandescent-like color and efficacy delivers a true no-compromise solution for both general and accent lighting," said David Turner, Cree director of marketing, LED Lighting. "This high-performance, retrofit lamp quickly installs into track or recessed fixtures and is available in flood or wide flood distributions, giving customers the flexibility to choose the most appropriate solution for their lighting needs." The Cree LBR-30 is sold through Cree LED Lighting sales channels and is currently shipping in volume. The inventor of the first visible light-emitting diode makes history again this year as it begins to show customers a 40-watt replacement GE Energy Smart® LED bulb available later this year or early 2011. GE Lighting's new LED bulb is expected to consume just 9 watts, provide a 77 percent energy savings and produce nearly the same light output as a 40-watt incandescent bulb, while lasting more than 25 times as long. The new GE Energy Smart® LED bulb is expected to outperform currently available products that may be underwhelming consumers right now. GE scientists and engineers designed the bulb to better direct light downward on the intended surface and all around, not just out the top of a lampshade, as most current LED bulbs are prone to do. The new GE LED bulb offers 450 lumens—the Energy Star® threshold to be considered a 40-watt incandescent replacement. Currently available LED bulbs produce 350 lumens or less. GE has filed multiple patent applications for the bulb and expects it will be an ENERGY STAR®-qualified LED omnidirectional light bulb. "This is a bulb that can virtually light your kid's bedroom desk lamp from birth through high school graduation," says John Strainic, global product general manager, GE Lighting. "It's an incredible advancement that's emblematic of the imagination and innovation that GE's applying to solve some of the world's biggest challenges." 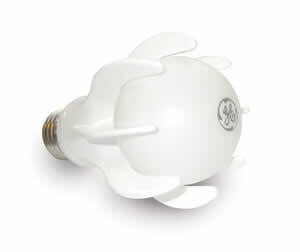 The 9-watt GE Energy Smart® LED bulb, a replacement for 40-watt general service incandescent bulbs, hits store shelves this fall or in early 2011. Retailers set pricing but it is expected to be $40 to $50. The new bulb joins GE's growing family of LED bulbs in a broad range of shapes, wattages and colors, including, spot and flood lights (PAR20 & PAR30), ceiling fan bulbs (A15), medium globes (G25), small globes (G16.5), candles (CA10), and night lights (C7). All of GE's Energy Smart® LED bulbs are rigorously tested to ensure constant color, long life and verifiable lumen ratings. For more information, visit www.gelighting.com or www.whatsyourlightingstyle.com. To learn about GE's dedication to LED quality standards, visit www.gelighting.com/apples-to-oranges. GE will put prototypes of the bulb—outfitted with Cree XLamp® XP-G LEDs—on display at two upcoming trade shows: Light + Building 2010 in Frankfurt, Germany, and LightFair 2010 in Las Vegas, Nevada, USA. The high-efficiency, high-lumen-output LEDs used in the GE bulbs are Cree's smallest and brightest lighting-class LEDs, designed specifically for general lighting. "The introduction of high-quality retrofit light bulbs, like the GE Energy Smart® LED bulb, is a key next step in the LED lighting revolution," notes Norbert Hiller, Cree vice president and general manager, LED Components. Strainic adds: "Consumers have been reluctant to move away from less efficient incandescent bulbs because they love the light quality. This new GE Energy Smart® LED bulb will address that lighting preference head-on and give consumers yet another option to light their homes and businesses." 60 and 40 watt bulbs can no longer be made in January 2014.